A visit to the observation deck of the Jin Mao Tower, one of the tallest structures in the world, offers an aerial view of Shanghai. As our Crystal Cruise docked in downtown Shanghai, the magnificent cityscape was mesmerizing. The skyscrapers that have been erected on both sides of the Huangpu River (an offshoot of the Yangtze that runs through the city) are incredible feats of engineering. Their design and construction is even more impressive once you learn that the buildings sit on a belt of seismic activity that has been hit in the past by powerful 200 mile-per-hour typhoons. As part of an all-day shore excursion offered by the cruise line, we took one of the two high-speed express elevators to the observation deck on the 88th floor of the Jin Mao Tower. In addition to a deck (called a skywalk) that is open to the public, the structure has a shopping mall, office space, and a 5-star Grand Hyatt Hotel with 555 rooms occupying the 53rd to 87th floors. The deck hosts the highest post office in China. The underground parking garage has room for cars as well as 2000 bicycles. Designed by an architectural firm from Chicago, the structure’s steel piles reach 274 feet into the ground. The exterior is covered in stainless steel, glass, aluminum, and granite, combining elements of both contemporary and traditional Chinese design. Tickets to the top are sold on the ground floor, where you are invited to pose for a photograph. The rapid ride up only takes 45 seconds and you can feel your ears pop from the change in altitude. Inside the elevator, an engraved metal illustration of the tower on the elevator wall has a small red light pinpointing your precise floor location en route. Once you arrive at the skywalk, windowed walls offers 360-degree city views from a space large enough to accommodate 1000 visitors at a time. Even on a cloudy day (which we were told is the usual weather in Shanghai), we were able to see the countless number of building rooftops below from every vantage point. Our ship, the Crystal Symphony, looked like a tiny skiff from 1380-feet above the ground. Those who aren’t prone to vertigo can walk to the center of the floor and gaze down at the dizzying view of the barrel-vaulted central atrium, which extends down to the 56th floor but appears to go on forever. The tower was completed in 1999 at an estimated cost of $630 million but in accordance with Chinese traditions associated with prosperity of the number 8, it was dedicated on 8/28/98. Once the tallest building in China, Jin Mao Tower now ranks number three in Shanghai and 17th tallest in the world, having lost its local standing to the neighboring 121-floor Shanghai Tower and 101-floor Shanghai World Financial Center, both of which can be seen outside it. Once you’re on the queue waiting for the elevator ride down to terra firma, you can purchase a kitschy souvenir: a Jin Mao Observatory Certificate and photo of your memorable visit above Shanghai. Open 8AM to 10PM, the entry fee to visit the observation deck of the Jin Mao Tower is CNY 100 (about $16 per person). The lines for the elevator move quickly because the elevator cars travel so fast. TIP: You can enter for free as part of a hop-on, hop-off city tour. FUN FACT: In 2007, the French urban climber Alain Robert scaled the Jin Mao Tower in a Spiderman suit. Shanghai police detained him when he returned to the ground 90 minutes later. Irene, with your eyes and your wonderful and exciting description of what you are seeing and experiencing brings joy to many who are unable to visit these lands. Thank you so much for bringing this to me. It’s been a few years since we visited Shanghai – but the city really impressed us with its amazing buildings (all different shapes and designs) and skyline. It must be something to travel to the top of the Jin Mao Tower and drink in those night views! The growth of the city over the last several decades is pretty mind boggling. Soooo, did you walk out on the glass floor? What a fabulous view! Your photographer is awesome! This is wonderful! I love your descriptions, the photos, all the excitement associated with this city. I love getting up high and seeing the city from that vantage…so much fun. Love your photos! What an incredible trip! It’s incredible to imagine that 1000 visitors can fit on one observation deck. They really do things in a big way in Shanghai! I enjoyed this area of Shanghai and I remember this building. I’m not sure why I didn’t go to the top. Next time! Next time, there will be a taller one! 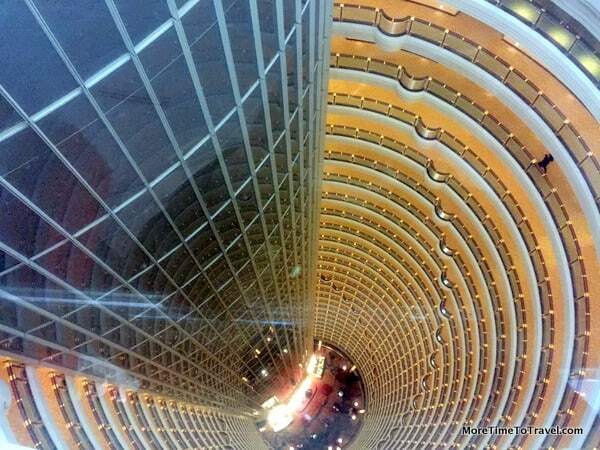 Wow, I would love to go up in the Jin Mao Tower! The views are stunning — the cityscape and also the view of the barrel-vaulted central atrium. The architecture is very interesting. How cool to see an aerial view of your ship from the Jin Mao Tower. One thing I love about Asia is the use of color in the cityscapes. What a marvelous view of Shanghai’s skyline in your photo. I will admit to a bit of queasiness with the spiraling down to the atrium, but the Jin Mao Tower is truly a masterpiece. I felt vertiginous (I guess spellchecker thinks that is, in fact, a word) just looking at your PHOTO of the view down the spiral barrel. I’m not overly fond of heights, but I think I’d make an exception for this building and view. I’ve been to Hong Kong and Singapore which have pretty impressive city-scapes, but I think that night view of Shanghai is even more dramatic. The views are especially dramatic at night because of the colorful lighting. You provided an excellent description of the Jin Mao Tower. I felt like I actually took the tour. And I do appreciate that because I’ll be in Shanghai next week and I will definitely skip this one. I don’t like heights! You’ll love Shanghai, Carole! Enjoy! Wow Irene, what a feat of engineering. I don’t think there is any skyline that has changed as rapidly as Shanghai’s. The view from the top of the Jin Mao is nothing short of spectacular, but that center atrium made me a bit dizzy. I’m not sure i’ll ever get to this impressive city, so your tour was the next best thing! The number and height of skyscrapers in the large cities China is simply mind-boggling. We have to visit this building! 8th floor! That’s the address I would like to be in. Bill and I got married at 8 pm on 8/8/08! Love the way you tell stories and your photo of the center atrium! Thanks for this find! That’s the 88th floor, Carol! Are you sure you still want to go? Shanghai is an urbanist’s dream come true. Thanks for alerting us to such a great viewpoint!